I've had this photo ready to post for a while but haven't had the chance until now. This was the painting I did on site last Saturday. My main interest here was to try and capture some of the warm light that occurs around sunset. 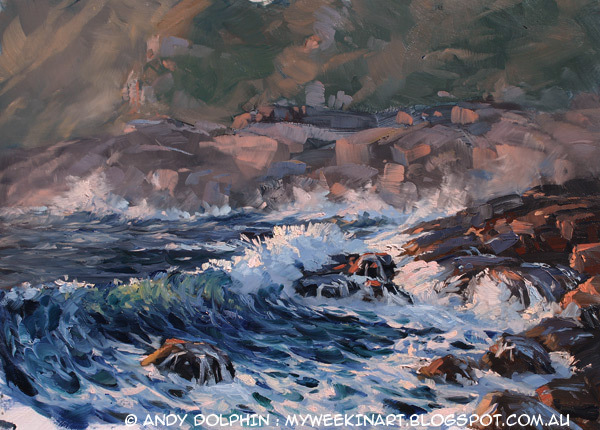 To achieve this, I added cadmium scarlet to my palette and introduced it into the background haze and all sunlit areas. I pushed the water colour toward green in order to make the complementary warm reds appear even warmer. In reality, the warm light was very short lived and much of what's in the painting is invented. I'd finished the sketchy background long before the light warmed up. As a sketch, it works just fine. If I make any adjustments, or if I make a larger painting from it, I'll likely reduce the intensity of the blue-greens in the water, darken the background and push the brightest highlights even more towards orange-red.